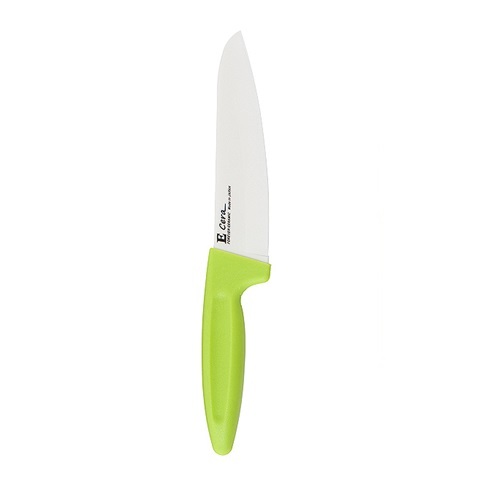 Ceramic is a noticeable material for a new generation of kitchen knives. A light and sharp material. Besides, kitchen knives from Sakura sera series are high density = high wear resistance based on their unique technique. It keeps its sharpness 200 times longer than stainless steel! Moreover, it doesn’t change colors and tastes of food because it doesn’t have a metallic taste. Comparing super ceramics made by compressed method to ceramics made by sheet method, super ceramics’ wear resistance is five times more higher than other ceramics. It was proved by Catra’s experiment.